Hero Honda has finally launched the much awaited tourer bike - Karizma ZMR Fi in. Karizma ZMR will be sold along with old Karizma model, Hero Honda has decided not to phase out Karizma R and sell both the models side by side. The stance remains the same as the old Karizma which is still considered to be the best touring bike with smooth, refined and relaxed Honda engine at the helm. The major and much needed change is addition of programmed fuel injection (PGM-Fi) in the engine. Additionally it also gets disc brake at the rear, gas charged rear shock absorbers, little increase in power and torque. Hero Honda also started giving teaser advertisement on leading TV channels in which they show few glimpses of New ZMR's front fairing, headlight and tail light. 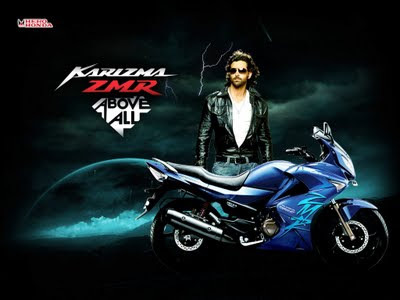 And now they have started full commercial of Karizma ZMR featuring Hrithik Roshan. He drives the ZMR through water and dodges few tornados. ZMR looks quite stunning in white shade in the commercial with ZMR sticker in red shade. To view the TV commercial scroll down this review to images and videos section of Karizma ZMR. In terms of looks the most visible change is heavy looking full front fairing with a lot of snazzy graphics with 'ZMR' stickers. Though it seems a liitle bit overworked and give Karizma ZMR a plasticky look. The designers at Hero Honda 'R&D' must have been a fan of Suzuki Hayabusa!! As far as new features are concerned the New Karizma ZMR gets all new headlamps with integrated blinkers and new tail lamps which are now LED ones. The fit and finish is quite good, there are no panel gaps and paint quality is awesome. The rear view mirrors have been mounted on the front fairing a.k.a Yamaha R15, which is the best part of the facelift and it gives Karizma ZMR a very aggressive look if viewed from front. But the main problem is if you view the bike from side - the front doesn't gel with the slim looking rear. Hero Honda should have made the rear end a bit heavy to match it with the heavy front fairing. All in all, New Karizma ZMR looks much better than the outgoing model which started looking very outdated in comparison to the Yamaha R15, Bajaj Pulsar 220, TVS Apache RTR 180 & Honda CBF Stunner Fi. The Intrument cluster is best looking part in Karizma ZMR. Insert the key and you are greeted with a long scrolling message which ends with "Bon Voyage Fly Safe". The display is now full digital including the tachometer which has been designed in round shape under a horizontal digital display which looks very cool especially at night. The display also shows real time fuel consumption which is very helpful in maintaining good mileage. Other tell n tales include the speedometer, trip meter, fuel indicator, clock and rev counter. The switchgear remains the same and, in true Hero Honda fashion, there is no engine kill switch. The instrument cluster features dual colour illumination - the tachometer is lit in white while the rest gets an orange backlight. New Karizma ZMR Fi is powered by the same 223cc engine but has been altered by Hero Honda engineers, now it gets fuel injection which has increased the maximum power to 17.6 Bhp at 7000 rpm which is up by 0.6 Bhp and maximum torque has been increased by .15 Nm which is now 18.35 Nm @ 6000 rpm.Hero Honda has claimed top speed of 126 kmph and 0-60 km in 3.7 seconds in its official brochure but it is still slower than the current fastest bike in this segment - The Pulsar 220, which has top speed of 144 kmph. Also I expected much more power and torque from the altered Fuel Injected engine, Karizma ZMR should have been atleast touching around 20 Bhp with 21-23 Nm torque.The PGM-Fi system is equipped with a 12 hole fuel injector, 16 bit ECU and 6 high-tech sensors to scan the engine operating parameters like air pressure, air temperature, and engine temperature to ensure the optimum air / fuel ratio under dynamic conditions. An advanced vertical oil cooler provides efficient cooling to the high performance engine and the IACV (Idle air control valve) ensures idle stability and smoothens response to throttle changes. In my opinion Karizma ZMR looks best in Blue shade which gives it a bigger and meaner look. In yellow and red shades it looks a bit plasticky and down grade. 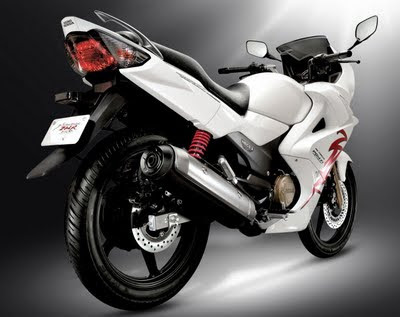 Hero Honda has also introduced white shade with the launch of Karizma ZMR. The autorised dealers have started taking bookings of New Karizma. In whole bike market of India,there is nothing sportier and stylish bike than Hero karizma.It's main feature is its headlight and mask.Its 225cc engine makes it powerful and speedier than other bikes.